Many people just float out of meditation retreat at Brookfield and feel amazing, often with lasting effects for days afterwards. It is not only the relaxation response at play, there is a spiritual dimension that is touched upon during deep meditation. On the scientific front, it is through meditation we retrain our brains, creating lasting neuroplastic and epigenetic changes in brain and body. We remember what it really means to be present, compassionate, connected and at ease. The memory of what it feels like to be truly at ease is the most beautiful jewel that really keeps us returning to our meditation community and a daily meditation practice. 1. Meditation is the most effective, natural mind-body medicine of the current times and is an effective treatment in dealing with depression – equally as effective as anti-depressants. 2. Strangely enough, slowing down to meditate improves productivity, efficiency and health. It brings back our energy levels and really allows us to focus the mind – when well trained the mind becomes our very best friend, a welcome tool to be used wisely in all situations. 3. Most interestingly, meditation is on par with regular exercise for its proven benefits!!! 4. The brain exercises we employ through meditation are proven to lead to a decrease in healthcare utilisation. 5. Meditation is proven to make us more compassionate human beings. Compassion meditation improves the health of our nervous system, our vagal tone. Regular meditation practice changes the brains response to stressful stimuli and reduces regular adrenal rushes, anxiety and stress, having excellent effects on the cardiovascular, digestive, musculoskeletal, immune and endocrine system’s. How can you make meditation a part of your everyday life? Meditation is not always practised seated – you can practise walking meditation, eating meditation, yoga nidra, smiling meditation, standing meditation – all which have amazing benefits. Second to sitting, I am personally most interested most in driving meditation, gardening meditation, and walking meditation – which I always try and practice when I don’t have time to sit and meditate for an hour or so. What kind of spiritual experiences might I have? Meditation from a spiritual perspective helps us gain insight into the value of impermanence, no self, and liberation of the usual mental constructs. This realisation is recorded to be happening in the brain as well – the blood flow to the parietal lobes (orientation areas) decreases in meditators, which leads us to loose the normal association of time, space and self! That is why we can float away from meditation retreats – and for a while forget about our usual story and our everyday stressors. Meditation has the ability to release us from the bind of our karmic patterns, right down to the level of our DNA. It changes our genetic coding and is highly endorsed in the field of epigenetics. Meditation is a gateway to everyday spiritual enlightenment. 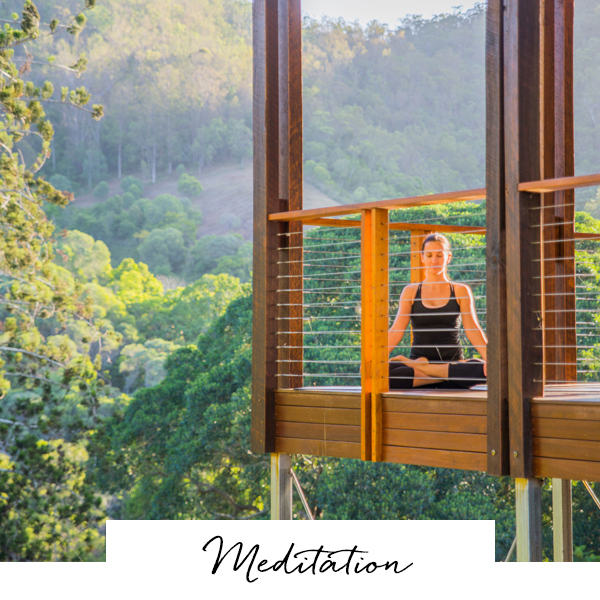 How do I practice meditation at Brookfield Retreat? Those who wish to go deeper or become meditation teachers with the Yoga and Integrative Medicine Institute – check out of meditation teacher training program here.